(a) Image of HAMR with body-fixed axes shown, and tracking markers and components labeled. (b) Schematic of a lumped parameter electrical model of a single actuator and associated piezoelectric encoder measurement circuit . (c) A block diagram of the proposed sensing and control architecture. Here x r is the reference actuator position and velocity, ˆx a is estimated actuator position and velocity, u f is the feed-forward actuator voltage, u a is the control voltage, and ˆu a and y are the sensor measurements. The design of the estimator and controller are discussed in Secs. 3 and 4, respectively. Credit: Doshi et al. A team of researchers at Harvard University and Wyss Institute for Biologically Inspired Engineering has recently developed a computationally efficient framework for the estimation and control of leg trajectories on a quadrupedal microrobot. Their approach, outlined in a paper pre-published on arXiv, achieved accurate position estimation and control, and the robot moved across a wide range of stride frequencies (10-50Hz). Terrestrial animals, animals that live and move predominantly or entirely on land, navigate natural terrains using a variety of complex leg trajectories. Their choice of leg trajectories often depends on a series of morphological factors, such as their posture, hip and leg kinematics, ankle and foot designs and actuation capabilities. "Animals also modify their leg trajectories to meet performance requirements such as speed, stability and economy, as well as to adapt to external factors such as terrain type and surface properties," the researchers wrote in their paper. "Inspired by their biological counterparts, large (body length ~100cm) bipedal and quadrupedal robots typically have two or more actuated degrees of freedom (DOF) per leg to enable complex leg trajectories." In the past, due to limitations in actuation, sensing and computation, small-legged robots could only achieve effective locomotion via carefully tuned, mechanically mediated leg trajectories. Recently, however, advances in manufacturing have enabled the development of tiny-legged robots that can operate at multiple stride frequencies and with multi-DOF leg trajectories. Currently, biologically inspired two-legged and four-legged robots employ a variety of control schemes, which allow them to adapt to different environments and performance requirements. Past studies have proposed a variety of approaches to attain stable and dynamic locomotion in small legged robots, including optimization algorithms, controllers using stochastic kinematic models and deep reinforcement learning algorithms. Despite the promising results achieved by many of these methods, each of them comes with its own set of limitations. (a) Experimental setup with single-leg used to evaluate estimator performance, with components labeled. Ground truth is provided by a calibrated fiber-optic displacement sensor (Philtec-D21) at 2.5 kHz. (b) Communication and estimation block diagram for estimator characterization in the actuator frame with blocks implemented on the xPC target shaded in orange. Note that the Kalman updated gains (matrices A, B, H, D, and K; shaded in blue) are pre-computed off-line. Credit: Doshi et al. The Harvard Ambulatory MicroRobot (HAMR), which uses high-bandwidth piezoelectric bending actuators, has been found to achieve rapid locomotion, yet its high-performance operation is still limited to a narrow range of stride frequencies. In their recent study, the team of researchers at Harvard University and Wyss Institute set out to develop a new approach that could attain effective locomotion of the HAMR robot at multiple stride frequencies. 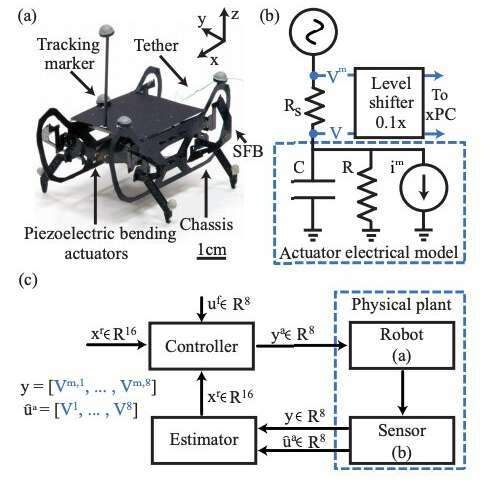 "In this work, we leverage concomitant sensing for piezoelectric actuation to develop a computationally efficient framework for estimation and control of leg trajectories on a quadrupedal microrobot," the researchers wrote in their paper. "We demonstrate accurate position estimation (<16% root-mean-square error) and control (<16% root-mean-square tracking error) during locomotion across a wide range of stride frequencies (10-50 Hz)." HAMR is a 4.5cm long quadrupedal microrobot that weights 1.4g. Each of its legs has two DOFs, which are driven by piezoelectric bending actuators controlled with AC voltage signals. The approach devised by the researchers estimates leg positions and velocity, then uses these estimates to generate a variety of leg trajectories for improved locomotion. This method allowed them to explore two parametric leg trajectories, investigating the influence of leg slipping, stiffness, timing and energy on locomotion performance. This parameter sweep ultimately resulted in an experimental performance map, allowing them to select control parameters and determine leg trajectories that maximize performance at a particular gait and stride frequency. Using these parameters, the researchers achieved remarkable performance across a wide range of stride frequencies. "In the future, we aim to use this low-level controller in conjunction with trajectory optimization to design feasible leg trajectories that optimize a given cost (e.g. speed, COT, etc.) at a particular operating condition," the researchers wrote in their paper. "This can automate the challenging task of designing appropriate leg trajectories for a complex legged system and result in better locomotion performance." The findings gathered in this recent study suggest that HAMR is a highly efficient platform for testing hypotheses related to biological locomotion. In the future, the controller devised by the researchers could also be combined with computationally efficient whole-body locomotion controllers to attain accurate tracking of leg trajectories during different types of locomotion, for instance when the robot is swimming or climbing. With all of these and future robotics improvements, will the future bring about the death of the human and animal species? Will robots of the future be so smart as to be able to discern which are organic species in opposition to inorganics like themselves? And most of all - will robotics programming instill a "protection of all organic species" rather than "protection FROM organic species"? Humans are so creative with machinery - but that creativity just could be the downfall of their own kind - which is another lesson in the futility of humans having been given the ability to choose right from wrong when they have a preference for wrong.